BALTIMORE – Now that they’ve finished training camp and separated the men from the boys, the National Football League opens regular-season play this week so the survivors can begin separating any lingering healthy limbs and ligaments from each other. In professional football, that’s how you know things have gotten serious. But, as much as physical pain marks the game, so does politics. For example, Colin Kaepernick’s back in the news, bracing himself for the next verbal onslaught from President Trump, who ought to have more important things on his mind. Jack Gilden’s new book reminds us that the game, even in its golden era, has always had controversy. But it was usually well-hidden. Gilden uncovers much that we never suspected, in a book about two of the most legendary figures the game has ever known. 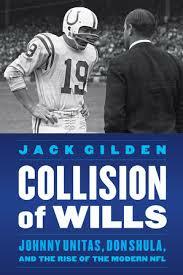 It’s called “Collision of Wills: Johnny Unitas, Don Shula, and the Rise of the Modern NFL,” and it’s doggedly reported and sharply revealing. This one’s not for the hero worshippers who wish only to think of their favorite teams as happy bands of brothers. It’s about one of the greatest teams in football history – the late, lamented Colts before they were snatched from Baltimore – and the sheer contempt their quarterback and coach had for each other. What’s initially remarkable is how little this relationship has been covered over the years. Pro football’s dissected like stock market tabulations or Hollywood love lives. How did this unholy alliance escape everybody’s notice? What’s also remarkable is the won-loss record Unitas and Shula patched together despite their mutual antipathy. In the midst of their anger, these guys beat the pants off almost everybody for seven years. In the five-year heart of it, the Colts won 55 games and lost a miniscule 12. Over two of those years, they lost a total of two regular season games. But the two men were an uncomfortable merger of the old way of playing the game, and the computer age that was just over the horizon. Unitas was a throwback who wanted to run his own show – call his own plays, check off at the line of scrimmage, command his own huddle. But Shula – who’d go on to win 347 games, more than any other coach in pro football history – saw himself as chief among deities. Never mind the two championships Unitas had already won, and never mind his MVP awards or his legendary Sudden Death championship victory that helped create America’s new national pastime. That was old business. Shula was there to do things his own way. What’s more, he was a screamer, and Unitas couldn’t stand such behavior. Their relationship forms the spine of this book. Theirs was an era of transition. What Unitas and Shula helped create, Gilden writes, has ironically been both overexposed and lost, the game going “from grass to ‘synthetic turf…’ from crumbling old baseball stadiums to publicly financed football palaces. “It went from being a longed-for treat every Sunday to a Monday-to-Thursday night TV show. It went from a championship game played in front of real fans in the snow and the rain and the mud and the blood to a Super Bowl, a neutral-field warm-weather extravaganza wrapped in a sometimes obscene halftime show. One of the “oligarchs” was named Robert Irsay. But, what Irsay did wasn’t just steal away the beloved Colts of Baltimore – he set an example for every other owner in professional sports. Get me a new stadium, or else. Get me luxury boxes, or else. Get me sweetheart deals, or else. Pro football’s profound success begat profound municipal blackmail. “Collision of Wills” takes us beyond the playing field. It’s about Unitas and Shula, yes, but it’s also about the swaggering new breed of jocks, personified by Broadway Joe Namath. It’s about the man who preceded Irsay, Carroll Rosenbloom, and his betting (and bedding) habits and his questionable drowning death. It’s about the toll that the game takes on vulnerable human brains. Among the numerous old Colts Gilden visited, we see the old quarterback Earl Morrall. “My recall button don’t work too well,” Earl would say over and over as a pat reply to any question about his life, Gilden writes. There’s our connection to dreadful modern reports of football brain injuries. But, bigger than all this, the book’s also about the changing America of Unitas and Shula’s time, an America dealing with race and class and sexuality and culture in ways it never had before. Point of full disclosure: Gilden says some nice things about me in the book, and quotes me a few times. But the book doesn’t need my help. It’s written with a pro’s style and insight and intelligence. And an adult’s approach to what we used to think of as a kids’ game.